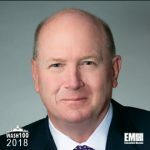 Executive Mosaic is honored to introduce Ken Asbury, president and CEO of CACI International, as an inductee into the 2018 edition of the Wash100 — Executive Mosaic’s annual selection of influential leaders in the government contracting arena–for his work on expanding the company’s contract portfolio into the national security services market and intelligence community. CACI booked $349 million in undisclosed classified contracts for information products and services in support of national security programs during the first three quarters of its fiscal year 2017 that ended March 31. He said at the Arlington, Virginia-based defense information technology contractor’s earnings call in November that CACI plans to build up its products through investments in electronic warfare, machine learning and other technology capabilities that he believes could help broaden offerings for the intelligence services market. Three months prior to that, Asbury said the Trump administration’s increased spending on military efforts against the Islamic State militant organization has resulted in a number of contract wins for the company in the defense sector. “I do think, in the national security space, we are going to see an increasing budget,” he added. CACI won several contracts this year that include a potential $173 million task order from the U.S. Army to develop simulation and modeling tools for sensor and imaging systems, a $94 million indefinite-delivery/indefinite-quantity contract from the U.S. Air Force for engineering services and another $91 million Army task order for the development of airborne intelligence systems. The company was also named to The Washington Post’s 2017 Top Workplaces list in the “large company” category for the third year in a row. “Being named to The Washington Post Top Workplaces list again this year is exceptional, and I thank our D.C. area employees for valuing our company and bringing their best to all we do,” Asbury said. Executive Mosaic congratulates Ken Asbury and his team at CACI for their selection to receive the award.